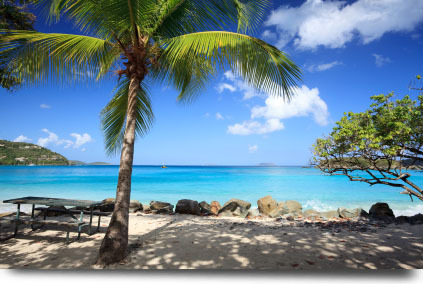 Saint John weather makes planning your Caribbean island vacation simple. At just 28 miles in area, St John is the smallest of the main islands that make up the U.S. Virgin Islands, part of the Leeward Islands, Lesser Antilles. The neighbouring islands of St Croix, St Thomas and Water Island are also dream destinations when thinking about caribbean island travel, but St John is regarded as perhaps the most perfect – everyone’s dream of a Caribbean getaway, with picturesque landscapes, fabulous unspoiled beaches and an idyllic climate. When should you plan your Caribbean island vacation to St. John? That is an excellent question. Clearly, you want to travel when the weather is best, right? Of course you do! With that said, Caribbean destinations all share a climate that attracts visitors throughout the year – copious, dependable sunshine, marred only by the occasional tropical or subtropical storms, and occasionally, hurricanes. St John weather is no exception to this picture, enjoying typical Caribbean weather, with only small temperature differences from season to season and sunshine even between the showers of the rainy season. Winter temperatures in St John range from highs in the upper twenties Celsius (around 80° F) and lows of about 20° C (69° F). In summer, high temperatures are in the region of 32° C (or 90° F), and low temperatures about 24°C (75° F). Average those out and the seasonal variation is only about 10° at most, with anything but balmy sunshine the exception rather than the rule. Weather differences between the different US Virgin Islands is negligible, and dependent on local geography. As with other Caribbean islands, the easterly trade winds (which also give their name to the local St John newspaper) are an important climatic influence, keeping temperatures even. The climate on St John and its neighbouring islands is milder than many Caribbean islands, where temperatures and humidity can be considerably higher, making it one of the ultimate Caribbean island vacation destinations. Planning Your Caribbean Island Vacation Travel: When Does it Rain, and How Much? The US Virgin Islands are generally slightly drier than the neighbouring British Virgin Islands a few miles to the northeast. The US Virgin Islands experience about 54 inches (1370 mm) of rainfall per year, as opposed to about 40 inches (1 000 mm) per annum in the British Virgin Islands. Hurricanes and storms are the curse of the Caribbean, but should not deter visitors from experiencing these tropical paradises, of which St John is a prime example. The US Virgin Islands lie directly within the Atlantic hurricane belt, with the hurricane season extending from the beginning of June until November. In fact, the US Virgin Islands had an extended stretch of good luck, with no major hurricanes striking the islands from 1932 until 1989. Hurricane Hugo battered the area in that year, but damage was done mainly to St Croix. All the US Virgin Islands were hard hit by Hurricane Marilyn in 1995, though St Thomas bore the brunt of it. Hurricane Lenny was the most recent, in 1999, but of the US Virgin Islands, St John got off relatively lightly, with the most damage occurring on St Croix. Like other Caribbean destinations, emergency plans to protect residents and visitors are in place. You can see that planning a vacation to Saint John is pretty easy; with sun and fun nearly all year around. However, the best time for your Caribbean island vacation is probably between October and May for the best Saint John weather. So pack your flip flops and swim suit and get ready for the perfect Caribbean island holiday!